The IQ Air Healthpro is just like the Healthpro Plus. The difference is it does not have the V-5 gas cartridges. It does have room to add the V-5 cartridges later. This is a great filter for allergy suffers who would like to be able to upgrade in the future. It retails for about $700. 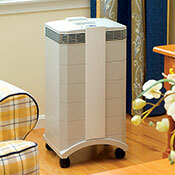 The IQ Air Healthpro uses a HEPA filter. IQ Air calls this a HyperHEPA filter. It is capable of removing 99.5% of particles 0.003 microns and larger. This means it is 100 times more efficient than a regular HEPA filter. The Healthpro does not have an activated carbon filter. It does have the room so a V-5 filter can be added later. Q pre-filter is used to help the HEPA filter last longer. This pre-filter is just as efficient as many other purifiers main filter. There is also a pre-filter for the pre-filter. It is an optional package. It is washable and should help the $60 pre-filter last longer. The pre-filter is about $60 and it should last 6 - 18 months. The HEPA filter is about $190 and it should last 2 - 4 years. The life of the filters depends on the environment. It is difficult to say how much it will cost to maintain this air purifier. We can assume a pre-filter will last 1 year and the HEPA filter will last 3 years. This would give us an average cost of $120 each year. Without the V-5 cartridge this is cheaper to maintain than the Healthpro Plus. The IQ Air Healthpro is certified to clean up to 900 square feet. That's a room 30 feet X 30 feet. In a room this size the purifier can provide only 2 air exchanges. To get 6 air exchanges it needs to work in a space about 300 square feet. The fan has 6 speeds and it can be programmed. It can run at different speeds at different times of the day. This unit is very good at removing particles from the air. This is the Healthpro's biggest strength. It does not cover a big of an area as we would like it to, especially for $800. It DOES work incredibly well. It will clean everything out of the air that passes through its filters. The IQ Air Healthpro is 28 inches X 15 inches X 16 inches (H X L X W). It weighs about 29 pounds. Casters can be added making it more portable. Other: Light tobacco smoke, wild fire smoke, smog, and other pollution sources. If you have allergies and want an air filter to help you breathe better, this is a great choice. It does an excellent job of filtering allergens out of the air. You get outstanding removal of allergens. This will not do as good of a job filtering out odors and chemicals. Although, it will remove some of them. It has the ability to be upgraded later. There is an empty section where the V-5 cartridge would go. If you upgrade it, you just add the cartridge to the machine. Anyone with allergies or asthma will greatly benefit from this air cleaner. If you have a chemical sensitivity this is not the best machine to use. You should look into either the Healthpro Plus or the CG Multigas. Overall, we really like this purifier. We think the IQ Air Healthpro does an excellent job of filtering the air. It can remove just about everything from the air. This unquestionable provides extremely clean air. However, it is quite expensive to buy. The replacement filters are not cheap. If you can afford it, this will give you what you need. Leave IQ Air Healthpro Page and Return to IQ Air Purifiers Page.